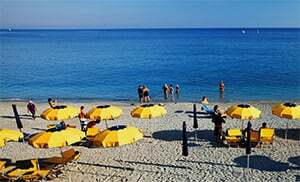 Liguria is known for its healthy and very fine olive oil, which is considered by many to be the best in the world. The Ligurian hinterland is dominated by wild romantic valleys and terraced olive groves. Land rows are divided into small portions to ensure that everyone takes good care of his piece of land. Some of these are difficult to reach and are on steep slopes. 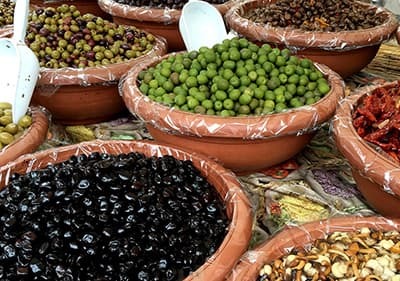 Olives are grown at altitudes of up to 600 m.
These were cultivated by the Benedicitan monks in the 11th Century in the course of organized olive growing and they spread quickly over the whole region. One of the reasons was that the mild good taste was very fruity and aromatic; it is regarded as particularly healthy. The relatively small olives are harvested in the season between November and March and grow in terrassed locations in the slopes. The farmers and their helpers hit against the branches with wooden sticks so that the fruit fall. About 10 kilos of olives are harvested per person per hour. The olive mill is able to do a cold press of 20 percent of it, which is equivalent to about 1.6 liters. Over 5 million olive trees thrive in the Imperia Province which is the main growing region. Each plant yields 3-8 liters of oil. Good cheap olive oil is non exisistent in Liguria because its yield is very costly. The oil maintains its quality when it is stored in the dark at 12-16 degrees. You can purchase it from the markets, grocery stores (Alimentari) or directly from the oil mills. If you want to know more about the history of the olive trees, we recommend that you pay a visit to the Olive Oil Museum "Museo dell'Olivo" in Imperia Oneglia. 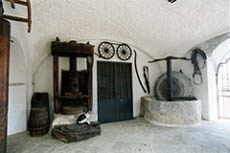 Inside an ancient oil mill, a permanent exibition, 'La civiltà dell'olivo' is presented by the antiquarian Frantoio Sommaria. A number of machines, utensils and other objects used in history illustrate the improvements made to olive growing and to extracting its oil.br> Entrance is free and there is also free tasting of local products. In 1900, Battista hired one of the municipality's olive presses for two years and started the retail selling. It was the beginning of a long journey to the present day. After Battista came Giuseppe (Roi) and Franco, the latest of the Boeri family who, together with his father, spends all his time and passion working at the family olive mill, as his forefathers had done before them for four generations. The business owns 15 hectares of land, 6 of which are exclusivley for the cultivation of Taggiasca olives. For the last 90 years 'olio extra vergine taggiasca d.o.p.' has been produced here. With the processing methods remaining relatively unchanged since their great-grandfather's time; the oil is still traditionally extracted and cold pressed by a mill stone, ensuring the best quality with every bottle. Today's 'Antico Frantoio - Old Oil - press' is a large building made of powerful walls, a roofed terrace and four guard rooms. It is a four-storied structure, probably hiding underground dungeons. 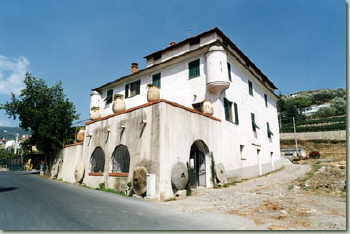 In the past it was a fortified house.At the beginning of the century, Stefano Saguato bought the building. His son Pietro with his nephew Stefano are today's owners. Respectful to tradition and ready for innovation, they stili go on devoting themselves with professional reliability and success to the development of Quality Oil and other typical Ligurian Products. Love for nature, family tradition and passion for quality oil these are the core values of the farm of Armato Cristina situated in Lucinasco a county located in the hinterland of the province of Imperia immersed in the olive groves. The company is the work of a family of four generations that has been handed down from father to son, techniques, practices and tools of olive oil with the same goal: to produce extra virgin olive oil from superior quality and unique taggiasca olives. Five hectares of olive groves and cultivated completely around the area surrounding the farm, some facing the sea and hills of the valley and at a different altitudes. The family tradition continues today with Cristina, her husband John and with the constant help of parents. Next to the main product 'Extra Virgin Taggiasca Olive Oil' you can buy olives in brine and the olive paté. Cristina also offers on request tours around the olive groves and explains how to produce olive oil. Love for nature, family tradition and passion for quality oil these are the core values of the farm of Armato Cristina situated in Lucinasco a county located in the hinterland of the province of Imperia immersed in the olive groves. The company is the work of a family of four generations that has been handed down from father to son, techniques, practices and tools of olive oil with the same goal: to produce extra virgin olive oil from superior quality and unique taggiasca olives. Five hectares of olive groves and cultivated completely around the area surrounding the farm, some facing the sea and hills of the valley and at a different altitudes. The family tradition continues today with Cristina, her husband John and with the constant help of parents. Next to the main product 'Extra Virgin Taggiasca Olive Oil' you can buy olives in brine and the olive paté. 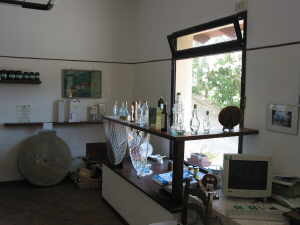 Cristina also offers on request tours around the olive groves and explains how to produce olive oil. Forget the large oil companies in Imperia. In Lucinasco, with Dino Abbo and his family, you will find the authentic Ligurian extra virgin olive oil. From their own olive groves, exclusively filled with Ligurian taggiasca olive trees, and from their own mill, the family presses their own fine oil, drop by drop. Rio Rocca lies in the hamlet 'Monti' above Pontedassio. In the restaurant belonging to the mill you will find cuisine made from their own crops. You can also enjoy some of the Ligurian specialties such as pesto, dried tomatoes, Ligurian fresh tomatoes, Ligurian olive oil and more. Rio Rocca's products are cultivated on their 10,000 square meter estate. With their 1600 olive trees, Rio Rocca is classified as a small business and can only sell its olive oil in limited amounts(i.e. directly from them only). Since 1600 his family has produced the Frantoio the olive oil (from the Taggiasca-Olive) with the help of his stone press and the cold pressure process. The production of a high quality olive oil has a long tradition in the Revello family. It was not just Pietro Revello who was convinced of the special, traditional methods used to make olive oil by his father, but his son, the present owner, is as well. The rare 'Taggiasca Olive' used in Vittorio Cassini's Extra-Virgin Olive Oil can be considered, in today's terms, an organic crop in accordance to European rules of farming and harvesting. The trees producing this olive are cultivated on the Ligurian hills of Perinaldo, Baiardo and Apricale, between 500 and 700 metres above sea level. Here they are unreachable by the insects that damage crops and so the plants have no need for any chemical treatment. The olive trees are fed exclusively by the natural elements. 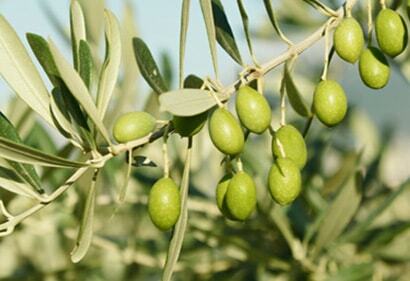 The harvesting is done by hand and this permits the selection of the finest quality olives. The cold press method used is known as the 'ciclo continuo', a new procedure that avoids oxidation or deterioration to the oil. It is only after this process that a very low acidity olive oil is obtained - which of course means the purest, cleanest taste. The above-mentioned process takes one hour to produce 50/60 litres of oil. In ancient times because of its purity, Ligurian olive oil was used as a medicine. Nowadays, it is considered a balanced condiment that has many of the essential natural nutrients the human body requires. Light and easy, it is digestible for people of all ages. The delicate fragrance, the intense yellow colour with a fresh artichoke fragrance and a pleasant after-taste of almonds, distinguish this oil. It is ideal for Mediterranean recipes and more, as it gives balance to simple dishes and enhances all flavours. An old oil mill from 1295. Opening hours of the natural food store: Monday to Saturday: 2:00 p.m. to 7:00 p.m. Sundays: closed. Besides olive oil, you can also buy home-made pesto. The pressing of the olives is undertaken every year from about October until about February. Oil, wine (Vermentino, Rossesse), pickled tomatoes, mushrooms, honey, etc.